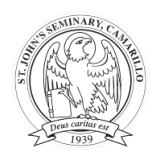 Since the Seminary does not want to take away from the local parishes and their celebration of the Eucharist on Sunday, guests for Sunday Mass at St. John's Seminary will be either those who have been invited or who have made arrangements for entrance to the seminary grounds. It is hoped that seminary family members and vocation directors in particular will join us for Sunday liturgy. Seminarians who have family members, friends, youth groups, etc. coming to St. John's Seminary should inform the Dean of Students. Seminarians will be responsible for front gate access for their guests. The gate will not normally be left open and it will not be the responsibility of the Dean of Students to open the gate for groups. Vocation directors should likewise inform the seminary if they are bringing a group. If they are not able to come with discerners, they can make arrangements with seminarians for gate access. It should be noted that the seminary is not able to invite guests to join the seminarians for lunch. Arrangements can be made with the kitchen for lunches but there will be a charge to offset any added costs incurred by groups. Other Sunday responsibilities have no change.